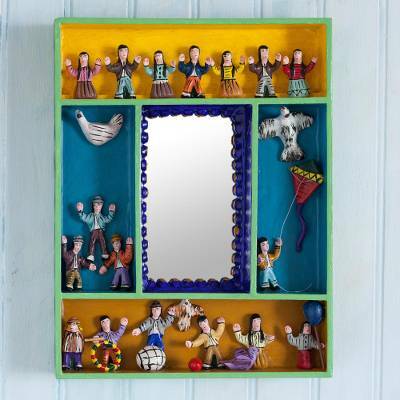 Hand-Painted Wood Retablo Wall Mirror Crafted in Peru, "Children at Play"
In a rectangular composition, scenes celebrating childhood games decorate the frame of this wall mirror from Peru. Alejandro Chavez designs this piece of wall decor, elaborating four sections with petite hand-painted figurines in the style of traditional retablos. From human pyramids to kites and soccer, this mirror captures the spirit of an Andean childhood. Novica sales provide Alejandro's family workshop with a steady cash flow. These sales account for nearly half of their monthly income, helping to ensure their survival. Markets and other seasonal outlets provide supplemental income that contributes to their annual living expenses. In the coming years, Alejandro hopes to grow his workshop and better his family by increasing his Novica sales. At school in Ayacucho, Alejandro began to learn the indigenous art of Andean retableria. Seeking to refine his craft, he apprenticed at the workshop of Angel Castro to learn the secrets of a master retablista. Upon his teacher's death, Alejandro founded his own workshop. There he began to incorporate his wife's modeled figures into his traditional retablos. Today Alejandro's nephews are his apprentices and his family workshop continues to craft their beloved retablos, which recount the culture and traditions of the Andes. One year away from his 50th birthday, Alejandro and his wife adopted a son and a daughter (Jose and Carol) from their hometown. Today Alejandro continues to provide for the education of his children and his grandchild, who joined the family in 2018. His daughter Carol is studying accounting and his son Jose is at the police academy. Alejandro Chavez has received 4 microcredit loans with 0% interest from Kiva and Novica, the first for $800 and the most recent for $1100. Proceeds were used to invest in the purchase of raw materials such as plaster, ceramic, plywood and paint. Unable to have children, the couple decided to adopt two children from their hometown. Their daughter Carol now has a child and the two of them live with Alejandro and his wife. "In every one of my creations I hope you will be able to recognize my great love for this art form." Alejandro Chávez was born on January 30, 1956. He specializes in the creations of retablos, a kind of reverent diorama-altar typical of the Ayacucho region of Peru. He learned this technique as a boy in school, when he was 17 years old and living in Ayacucho, where his parents moved when he was just 2 years old. When Chávez returned to his hometown, he began working in the studio of Angel Castro, a master artisan. Here he refined his techniques in the creation of retablos, eagerly learning the art from his teacher. Later, Chávez formed his own workshop after the death of his teacher, continuing to give shape to this art form. The customs and traditions of the Andean people emerge in every piece. "In every one of my creations I hope you will be able to recognize my great love for this art form. You will also fine the contributions of my wife as well, for she molds the characters. I am currently teaching my nieces and nephews as well. "I sincerely hope that you enjoy your retablo, which brings together the culture and traditions of the Andes." I have ordered several items from this artist; his retablos are out of this world beautiful! I just received my retablo! It is so sweet! The faces have such character and they make my heart sing. I think this is because señor Chávez has a song in his heart when creates these beautiful works of art. This is such an adorable addition to my nativity collection. It is such a fun piece. Thank you for sharing your passion with the world. Michele Maliaño.